Montpellier is a city in southern France on the Mediterranean coast. The city is capital of the Languedoc-Roussillon région, and as of the 1999 census Montpellier had an estimated population of 225,300. Montpellier is a city in southern France on the Mediterranean coast. Montpellier is the capital of the Languedoc-Roussillon région. As of the 1999 census Montpellier had an estimated population of 225,300. Montpellier is built on two hills (Montpellier and Montpelliéret), so as a result many streets contain great variations in elevation. 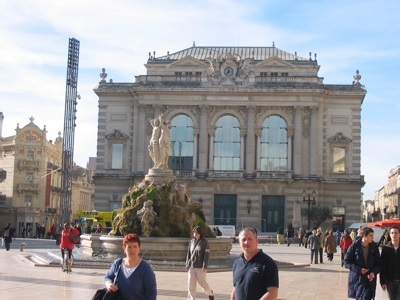 Montpellier is home to one of the oldest universities in the world. The University of Montpellier was founded in 1160, was granted a charter in 1220 by Cardinal Conrad von Urach, which was subsequently confirmed in 1289 by Pope Nicholas IV in a papal bull. The University was suppressed during the French Revolution, but was then re-established in 1896. Montpellier is also home to the oldest botanical garden in France. The Jardin des plantes de Montpellier was founded in 1593. Montpellier grew greatly in the 1960s, after it became one of the main destinations for French settlers from Algeria, who were resettled there after that country gained independence from France in 1962. Montpellier been the fastest growing city in France for the last 25 years. Montpellier has a Mediterranean climate with mild dry Winters, and warm wet Summers.